This post will be updated weekly until THE season begins. UPDATED: Pictures from Kyoto Botanical Garden are added on March 25th 2015. Cherry Blossoms season is a magical time for everyone, whether you like flowers in general or not. It is more than just viewing flowers. The experience of looking up and being surrounded by the elegant cherry blossoms is very unique and definitely memorable. It is exceptionally beautiful because it is ephemeral. But somehow it brightens up everyone who sees. For those who are lucky to stay in Japan and especially in Kyoto during this limited time of the year, this post is going to provide all the information needed, including when it starts, where to go and where to see illumination. When Does The Cherry Blossoms Season Starts In 2015? According to the latest information on when the cherry blossoms will start from the Japan Weather Association, it will start from the end of March in Kyoto. Keep in mind that this information is about a type of the cherry blossoms called Somei Yoshino, which is the most common one. When people mention cherry blossoms, aka Sakura, they mean Somei Yoshino. They are scattered all around Japan and mostly start blooming in succession from south to north. This year, according to the same agency, the cherry blossoms in the Shikoku Region will be first to open their flowers, which is supposed to be on March 19th (as of March 6th 2015). 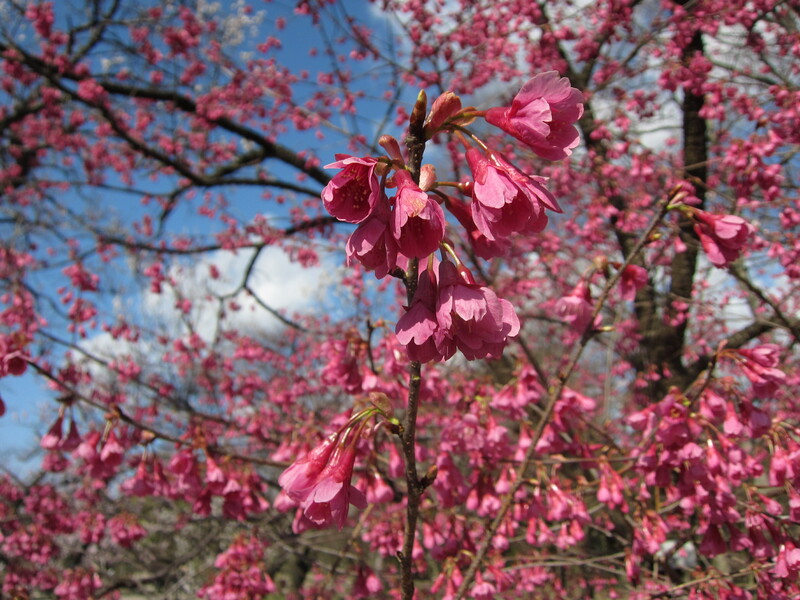 And on the other end, the last bloomers will be in Hokkaido, which will start in the beginning of May. As for viewing the cherry blossoms in Kyoto, assuming their prediction announced at the end of February is correct on March 26th 2015, the cherry blossoms will start on March 26th and the best viewing period will be from March 29th – April 5th. However as mentioned before, there are many types of cherry blossoms. When compared individually, not as a group, the weeping cherry tree is as beautiful and possibly even more gorgeous than Somei Yoshino. Weeping cherry trees start to bloom earlier than the Somei Yoshino kind. Therefore even if the Somei Yoshino has barely begun to bloom on the date predicted by the agency, don’t give up. Look for the weeping cherry kind. Below are pictures of two different kinds of cherry blossoms. Where Are The Best Place To See Cherry Blossoms In Kyoto? The cherry blossoms are lined up along the Biwa Lake Canal. This canal is very narrow and fits into the quiet environment nicely. Even though it will take some time (about 2 hours) and energy, the best route to enjoy the cherry blossoms here is to walk from Ginkakuji Temple, go along the path and finish at Heian Jingu Shrine. Access & Advice: The only way to get to Ginkakuji Temple (and Philosopher’s Path) is the bus, except for taxis, and it is usually very busy, especially during this season. Therefore, it is almost a requirement to start the trip early in the morning. From Kyoto Station, take the City Bus Line either 5, 17 or 100 and get off at Ginkakuji Mae or Ginkakuji Michi. 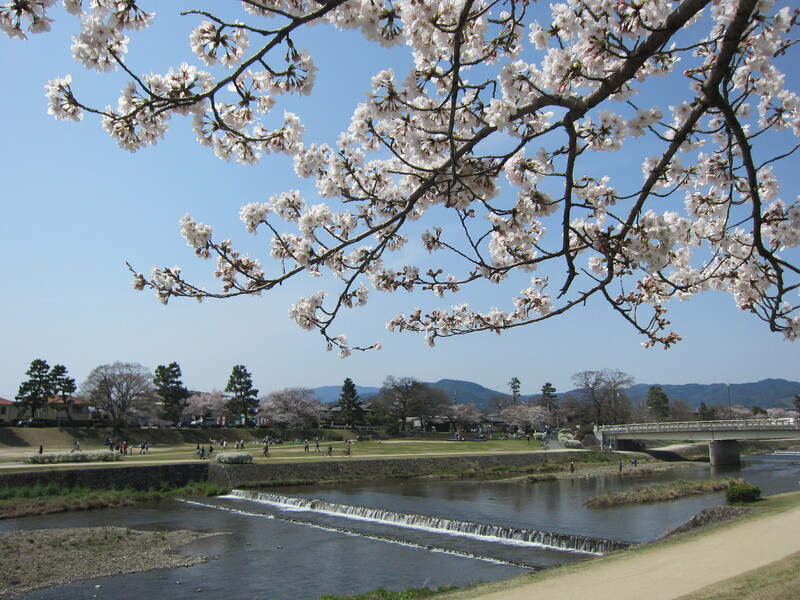 Kamogawa River has plenty of cherry trees on its riverside. The best viewing point is the area between Kitayamaohashi Bridge and Kitaoji Bridge (next to Kyoto Botanical Garden), called Nakaragi Path. Or Takanogawa River, which starts from the Demachi Yanagi Area (the one going east) is also a great place to enjoy the cherry blossoms. Access & Advice: To get to Nakaragi Path, the easiest way is to take Karasuma Line, get off at Kitayama Station and walk west to the river. Then just go south. As for Takanogawa River, either 1. From Imadegawa Station (Karasuma Line), go west on Imadegawa Street until the river can be seen. Cross the bridge and go along the river on right side. or 2. Take Keihan Line and get off at Demachi Yanagi Station, which is the terminal. Takanogawa River is right next to the exit. Some of the cherry blossoms in Kyoto Imperial Palace start early due to the specific type of tree, which is the weeping kind. Usually this type is bigger than normal Somei Yoshino and more gorgeous. Access & Advice: Kyoto Imperial Palace is inside the large park and the cherry trees are located north. Thus the best route is to take Subway Karasuma Line and get off at Imadegawa Station. Find the exit No. 3. Walk east and find the gate. Gion District is a special area with fancy bars and restaurants, where Maiko/Geiko (Geishas) work. In Gion, there is a stream called Shirakawa with cherry blossoms. The atmosphere in Gion is different from other places. Tourists don’t usually visit at night because of the nightclubs and invitation-only Geisha locations. But at this time of year, it is actually nice to visit Gion at night since there is an illumination event (this will be explained more later). Access & Advice: The best way to get to this place is to start from Hanamikoji Street and go along Shirakawa River to Kamogawa River. To get to Hanamikoji Street, take City Bus (Gion Express) and get off at Gion. The streets near this area are usually busy, so expect that it will take time to get there. Or for those who prefer taking a train & walking, take the Keihan Line and get off at Gion Shijo or take the Hankyu Line and get off at Kawaramachi, then walk east. Note that usually visitors go south at the cross road between Shijo Street (east-west) and Hanamikoji Street (north-south), but for viewing cherry blossoms, go NORTH. Maruyama Park is a well-located public park which connects Chion-in Temple, Yasaka Shrine, and Nene no Michi, which leads to Kodaiji Temple. These places are all worth visiting, but the park itself, especially during the cherry blossoms season is also good to visit. 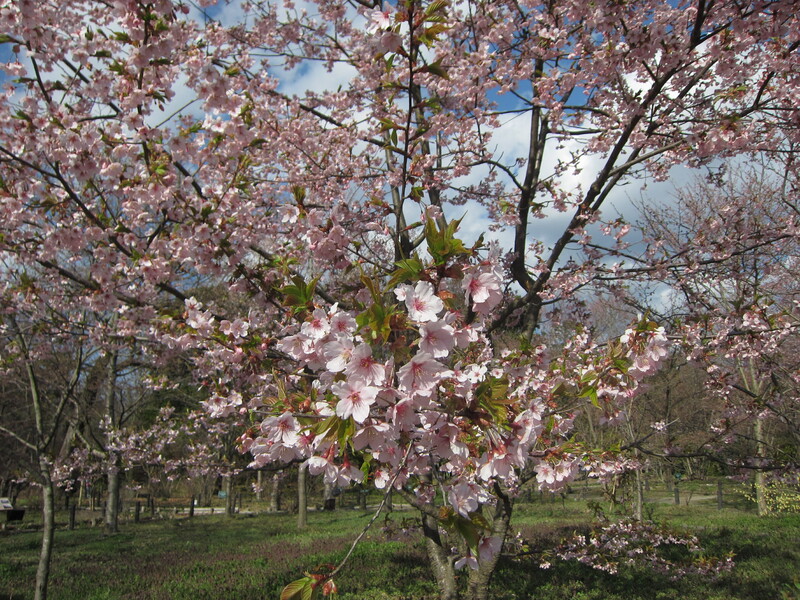 Just like the Imperial Palace, Maruyama Park also boasts weeping cherry blossoms. On weekends, hundreds of local people come to this park and have parties called Hanami, which literally means “viewing flowers”. Access & Advice: Basically the route used to go to Gion mentioned above can be used here to visit Maruyama Park as well. And for those who enjoy walking long distances, it is possible to walk all the way from Kiyomizudeara Temple, Sannnenzaka & Ninenzaka Slope, and Nene no Michi to the park (it might take a few hours). Hirano Shrine is not very famous four tourists but is actually prestigious and historical. This shrine used to be located inside the palace of the empress in Nara and was moved to Kyoto when the capital was moved. This means it has been here for more than 1200 years. At the beginning of April, this shrine is packed with people who want to see cherry blossoms. And due to the wide variety of cherry trees, they can be seen from the middle of March to the end of April. Access and Advice: The best idea is to combine a couple of sightseeing spots into a ONE DAY excursion. Around Hirano Shrine, there are Ryoanji Temple, Kinkakuji Temple and Kitano Shrine. Basically, to get any of these places, the City Bus is required. Because of its popularity, the bus going to Kinkakuji Temple is always very busy. This means, it is better to leave the hotel early and take the bus around 8：00 AM (Kinkakuji opens at 9:00 AM). Or go to Ryoanji Temple first, again early in the morning, then walk to Kinkakuji Temple and Hirano Shrine. Kyoto built a canal from Biwako Lake in Shiga Prefecture as a measure to stimulate the economy and society. This major undertaking started in 1885 and was completed in 1912. Now some of the parts have became sightseeing spots including the Philosopher’s Path and an aqua duct at Nanzenji Temple. Along the canal, there was a point where ships could not go on because of the steep slant. As a solution, a railway called “Incline” was made. As time went by, other transportation methods improved, which resulted in a decrease of the usage of Incline. And in 1948, this railway was totally closed down. However, as a movement to preserve this facility as an industrial asset, Incline and its railroads were rebuilt and in the beginning of April, this particular part of the canal is colored with vivid and cheerful cherry blossoms. 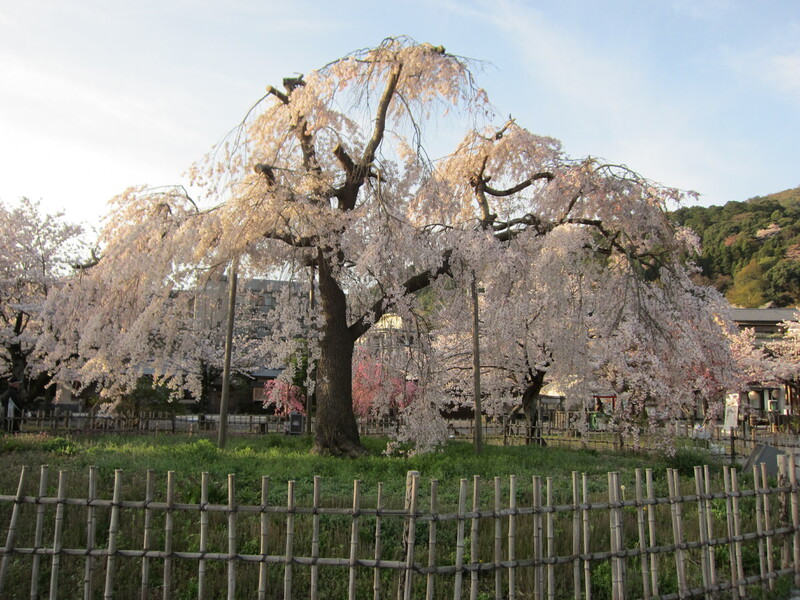 Access & Advice: The specific place where the cherry blossoms can be seen is in the Okazaki Area. To get to this place, the easiest route is to use the Subway Tozai Line and get off at Higasiyama Station or Keage Station. Incline is located between Nanzenji Temple and Heian Jingu Shrine, so it makes perfect sense to visit all these places in one day. In this case, start from Keage Station. Nijo Castle is worth visiting, even without the cherry blossoms. This is the place where Samurai Era was officially ended, when the 15th Shogun Yoshinobu Tokunaga returned the governance power to emperor in 1867. The buildings are historically and culturally important, however the garden surrounding these buildings is also highly rated. And it is particularly beautiful during the cherry blossoms season. Access & Advice: Although Nijo Castle also holds an illumination event, it is wise to go only when cherry blossoms are in full or almost in full bloom. To get to this castle, use Subway Tozai Line and get off at Nijojomae Station (NOT NIJO STATION!). Closed On: Tuesdays in December, January, July and August. December 26th – January 4th. Toji Temple, whose five-story pagoda is regarded as a symbol of Kyoto, has one big weeping cherry tree. This particular tree, which is about 120 years old, was transferred from Mie Prefecture 7 years ago, and become a new symbol of Toji Temple. Why not try to take a picture of both symbols in one frame? Also, there are many cherry trees in the premises and beautiful white and pink scenery is available. Access & Advice: Toji can be reached either by City Bus or a train called Kintesu (Toji Station) plus 10 mins of walking. As for the bus, take City Bus Line 16 (get off at Toji Nishimon Mae), 42 (Toji Michi or Toji Higashimon Mae) or 19/78 (Toji Minamimon Mae). Daigoji Temple boasts the historical fact that a regent called Hideyoshi Toyotomi visited and held a party to see the cherry blossoms in 1598. Hideyoshi is famous for reaching the top of national government from being farmer and for renovating Kyoto City. Daigoji Temple has a wide variety of cherry blossoms, which can be seen for three weeks. The area called the tunnel of Sakura on the approach is especially magnificent and worth visiting even though this spot is relatively away from the city center. Access & Advice: The easiest way to get to Daigoji Temple is to take a bus called Yamashina Kyuko (Yamashina Express) Bus run by Keihan Railway. It costs 300 yen/Adult and 150 yen/Child and starts from the bus stop No. 8 in front of Hotel Keihan Kyoto, which is located across the street from Kyoto Station’s Hachijo Side (opposite of Kyoto Tower). For those who are more comfortable with the train, take Subway Tozai Line and get off at Daigo Station. Walk east for 10 – 15 minutes. As the Price section below shows it costs about 2000 yen to see all of the sightseeing spots there. And (un)fortunately, each of these places has beautiful cherry blossoms. For those who want to stick to one of them, then Sanboin (garden/house) can be the best choice. In addition, for people who like hiking, it is a idea to get a ticket to enter Kami Daigo Area, which is actually a small mountatin with bunch of historical sites and picturesque scenery.